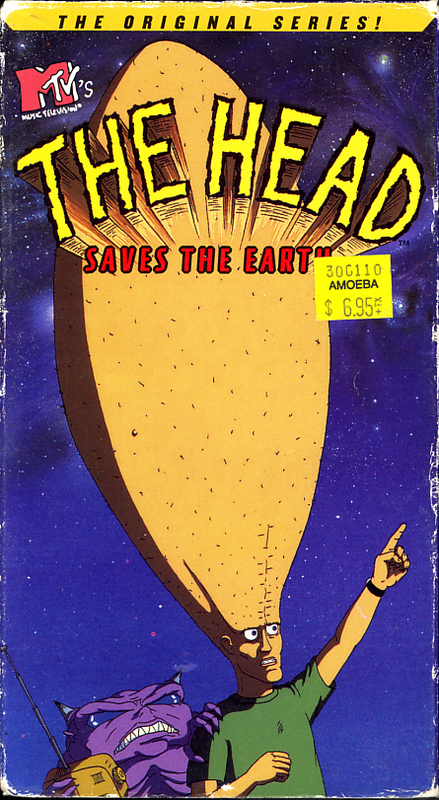 MTV’s The Head on VHS video. Starring Gordon Barnett, Jason Candler, Patricia Bibby. Created by Eric Fogel. With Mike Judge. 1994. At Last, A Cartoon-Super-Hero Who Really Uses His Head. Jim (The Head) is an animated mutant super-hero with an insanely large cranium. A freak encounter left him with a problem. A big one: he’s got an alien named Roy living inside his oversized dome. Plus, he’s got the added headache of having to deal with an impending invasion of Earth by a fiendish army of evil parasitic aliens. Jim and Roy are feverishly assembling the Anti-Invasion Machine, whose five pieces have been scattered throughout the world. Will Jim and his skull-dwelling companion have the skill to save the Earth? Only The Head knows.